Here is the picture of a close to stock bike. It's a 1979 Suzuki GS425E. Notice the club man handle bars on front. 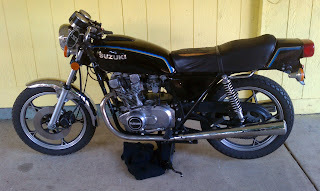 I have already done some work on the bike since I originally had gotten the bike a year and a half ago. Full set of gaskets from head up, fork seals, chain, rear brake (well I paid for it to be done and the guy totally ripped me off, took my money but didn't change them, never go to DR. Browns in Portland, OR). This is a project in the making and I will be posting all my progress as I go along. Hope you enjoy!